Hair Bands + Pipe Organs = A Way Forward? 2000 years ago, I took an undergrad course on critical thinking. It has caused me far more harm than good over the years; in truth I would be better off for not having taken it at all. I am no fun at parties (“So why does a gecko know anything about car insurance?” “Exactly WHO voted baseball America’s game?” “Why should a toilet smell like a pine forest anyway?”). And my husband and I never feel guilty about not paying for the address labels we receive in the mail that are decorated with small animals. Though we don’t use them, either. How does this related to [D]mergent? Beats me. No, wait – I do have a point. I am of an age (55) and position (ordained clergy) and geography (parish minister in a small college town in eastern Kentucky) at which I stand at a crossroad of worship style and function. 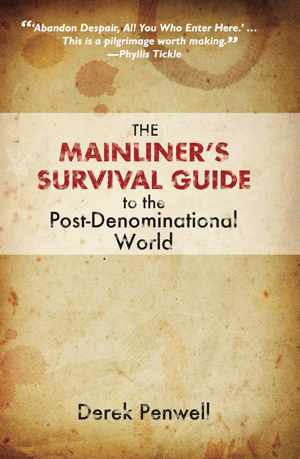 And though I have friends who speak both liturgy and contemporary, I would like to say a few words about the underlying theological pitfalls that can occur without using the above mentioned critical thinking. It occurs to me that, with few exceptions, folks label churches based on the style of worship, the genre of music used, and the dress of those on the chancel (or the stage). Hymnals, diaconate, robe: traditional. Big screens, ushers, golf shirts: contemporary. However, and this is a LARGE however, when one looks critically at what is being preached and implemented, where social change and justice issues are pushed and prodded – that’s another story. More often than not, the dude up front dressed like Charlie Sheen in “Two and a Half Men” is preaching a sermon that is – minus the cool graphics flashing behind him – straight out of Charles Spurgeon. The audience (never the “congregation”) is made up of a lot of folks who were teens in the ‘80s. (Which may be why so much contemporary Christian music sounds like stuff from Hair Bands in the ‘80s, but I digress). The outreach is geared toward making the world Americanized, Protestant, and full of soft ice cream and pay toilets. The music teaches a form of triumphalistic, uber-personal, salvationiness ; “MY God reigns! Woot!”. And conversely, the small dusty church with the pipe organ that is played on the one week of the month that the organist is not playing rehearsals for a show choir, with a minister wearing a stole that signifies a calendar that is alien to most, is preaching to a mix of 80 year olds in boiled wool St John suits and teenagers who have wandered in off the streets because the organ music sounded somehow safe and different to them. The church has most likely started a Moveable Feast for the AIDs victims in town, and their VBS is not packaged nor marketed, and is attended by children whose parents are nowhere to be found. Their music is often familiar to the point of nausea; but it does speak of theology. Some of it is quite faulty theology, but there nonetheless. My point? I think this is indicative of the odd and shifting sand that is the church. Right now, contemporary is IN, which means the movers and the shakers are there. The disenfranchised are moving into the traditional churches, in part because the movers and the shakers ARE heading to other pastures. Traditional churches no longer have the luxury of turning folks away – they’re in survival mode. Before we start judging or categorizing (and whatever happened to ‘unity, diversity, charity’?) we should look beyond the surface to examine the deeper message. Sure, sure, sure – traditional churches have to move into the 21st century, and get websites, play a mixture of music, and at least EXPLAIN why a robe can still matter. But there is one GREAT opportunity for them out there! There is an opportunity to practice resurrection, and be born again, IF the remnant still attending can be critical thinkers and figure out what Jesus REALLY wants them to do. But, please, just a request when it comes to marketing: don’t use a gecko, a coffee cup, or folks looking moody in the rain. Been done. 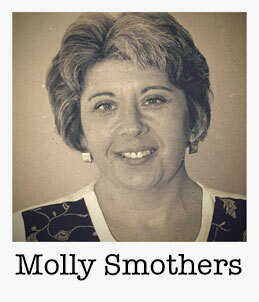 Molly Smothers is an ordained minister in the Disciples of Christ denomination. She has pastored congregations in Harrison and Montgomery counties in Kentucky. She lives with her husband Leon on a farm in Rowan County, where she has been the minister of First Christian (DOC) for the last five years. She enjoys klezmer music, and collecting yak hair.